We love Christmas here at StickyTiger, but it’s impossible to ignore that everything has gone just a teeny bit commercial over the last few years. While wandering around shops rammed full of tinsel and blasting Christmas songs certainly gets us in the festive spirit, you can’t ignore the fact that the kilometres of wrapping paper, broken plastic ornaments and tonnes of packaging aren’t exactly eco-friendly. Today, we’ve got twelve great alternative ideas that will make your Christmas magic without it costing the earth. Wood is a fantastically eco-friendly material, and as well as fitting in perfectly with the latest rustic trend, it’s long-lasting and doesn’t date. We love the idea of making tree ornaments from simple wooden discs, either decorating them with tiny pieces of foliage, or stamping on festive messages, while simple sticks or pieces of driftwood can be easily transformed into an impressive 3D Christmas tree. Watch this space for tutorials! Origami is one of the most popular crafts around at the moment; there are tutorials all over the internet covering everything from simple geometric shapes to fabulously complex and realistic paper flowers. We love the idea of crafting some paper decorations for our tree or mantle, and while there are loads out there to choose from, this paper snowman from Mini Eco (above) won our hearts; easy to make, with minimal materials and completely recyclable, it’s an environmentally friendly festive winner. Use foliage, pinecones and other items from the woods or beach to decorate with rather than fake plants and tinsel – not only are they free, but they can also be added to the composter or garden waste bin afterwards. Christmas tree sellers are usually more than happy to let people take the offcuts for free, and they look fantastic placed in vases and bottles – use seasonal fruits and dry your own oranges to decorate them with. 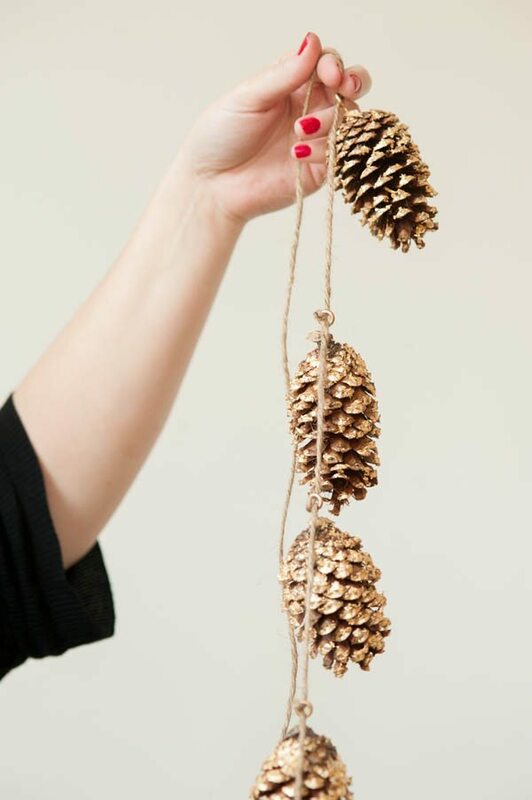 If that’s all a bit rustic for your style, add a bit of glitter by making a gold pine cone garland – we found a great tutorial for one over at The Sweetest Occasion. We said it last year, and we’ll say it again – printing your own wrapping paper is a much better all-round option for the festive season. Shop-bought paper isn’t recyclable, and because of the metal content, takes a while to rot away, whereas simple brown paper can be popped straight in the recycling bin after the big day. We like printing all over ours; everything from words and phrases, patterns and festive shapes – even simple leaf prints make great wrapping paper! We love the idea of making a DIY roller stamp, like the one over at Handmade Charlotte (above). If you want to go really eco-friendly, ditch the paper completely and use fabric to wrap your gifts; a pretty scarf is a great option, and also acts as an additional gift, while a simple square of beautiful fabric can either be reused by the recipient the following year, or turned into something lovely with the aid of a needle and thread. Ditch the plastic bows and metallic ribbons, which will end up in landfill, instead topping gifts with pinecones, sprigs of mistletoe and fragrant herbs – although this is probably an idea to keep for those gifts that don’t need to be posted! We love a good felt craft, so the idea of felt gift toppers was one that really won us over; not only can they be used as ornaments the following year, but they’re also wonderfully quirky and will make your gift stand right out. Lia Griffith has a fabulous tutorial on making woodland felt toppers over on her blog – so easy, but so effective! Make homemade natural bath products as presents and package in old glass jars, topped with fabric scraps and ribbon, instead of buying expensive products from shops which are packaged badly and full of chemicals. Make batches of cookies or give cakes as presents – they look beautiful wrapped in simple brown paper and tied with either bakers twine or pretty ribbon. Give any green-fingered friends a treat with the gift of a plant; potted in a hand decorated pot and finished with some pretty ribbon, it’s sure to be a winner! Most young children love playfood and role play, so why not make them some felt food or cooking items? Felt is so easy to cut out and sew, because it doesn’t require any hemming. We found this amazing felt campfire set from Felt Playground on Etsy, which we totally fell in love with!